Elected officials should be particularly sensitive and careful on the question of the role played by campaign contributions in influencing US policies toward Israel and the Middle East. There is no doubt that money often plays a major role in our political system. Since the only group Omar specifically mentioned in her offensive tweet was AIPAC, it is obvious that J-Street is agreeing with her that traditional lobbying for Israel is problematic and potentially could cause officials to change their positions to follow the money. J-Street absurdly styles itself as being “pro-Israel” even though there is very little daylight between its positions and those of the PLO. And the J-StreetPAC page brags that the largest “pro-Israel lobby” in the US is – J-StreetPAC! Not only that, it brags about its money influencing Congress! If pro-Israel PACs are problematic for the amount of money they give to candidates, then J-StreetPAC – which gave more to its candidates than all the real pro-Israel PACs combined in 2018 – must be worse! So which is it, J-Street? Is money to candidates a good thing or is it evil? Obviously, their money is kosher. Actual money from Zionists is immoral. NO ONE DOES THAT. No elected official has ever said that all criticism of Israel is antisemitic. No leader of any Zionist organization has ever said that. Criticism of Israel is antisemitic when it violates the 3D test that Natan Sharansky posited back in 2004 – when Israel is demonized, delegitimized or subjected to double standards. The test is pretty easy to understand and is the best definition of when criticizing Israel is crossing the line out there. It is the people who want to violate the 3D test who are the only ones who complain that “all” criticism of Israel is considered antisemitic. 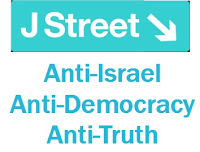 J-Street obviously does not subscribe to the 3D test of what is antisemitic. In fact, J-Street seems to consider no criticism of Israel – or even calls to boycott the Jewish state – to be antisemitic. while I see lots of charges on its site that republicans are antisemitic, I cannot find a single time where J-Street admits that Arabs have said a single antisemitic thing. This press release where J-Street pretends to be “nuanced” shows, when analyzed, that J-Street’s position towards Israel is indeed perilously close to those of the antisemites who are obsessed with destroying the Jewish state.